Welcome to The Clubhouse at Elmridge. 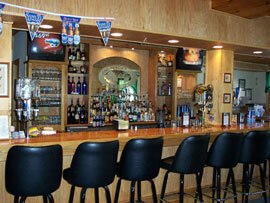 After your round, make sure to stop in and visit our full-service bar. You can lounge on the covered deck overlooking the course, or get your food to go between nines. The Clubhouse at Elmridge is the ideal venue for weddings and other special events. Our main dining room seats 80 - 100 guests comfortably.